Both Baking and Cooking bring out the inner creator and artist in most of us, with cooking allowing for a bit more flare when it comes to skipping the need for accurate measurements and adding “a dash of this” or a “handful of that”. Baking is more of a science and it is advisable to carefully measure out all ingredients and add them in the order as stated in the recipe. It’s only once you’ve been baking for a while that the confidence develops and the sense of “knowing” how many of your favourite spoons to add to equal a certain amount. 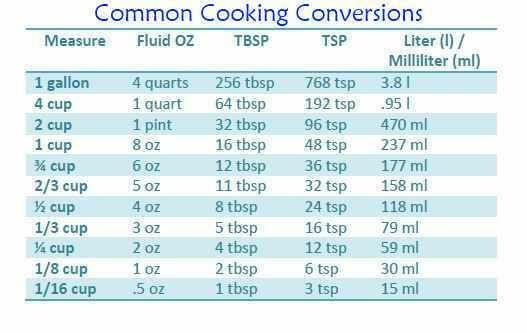 Also, with so many recipes freely available on the internet, it can be frustrating if you don’t know how to convert from metric to US measurements, or pounds to teaspoons. A good friend suggested adding a few tips to this site which reminded me to look at the very first page of my very first hand written recipe book from way back when when I first began baking. It is a list of measurement conversions that has been very helpful over the years. Measurements should be levelled off (the back of a knife blade works well) or loosely packed, unless the recipe specifically calls for “heaped” or “firmly packed”. Love the Conversion tables – thank you!